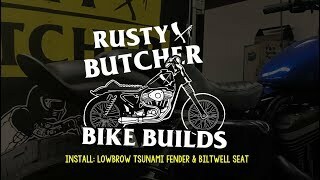 The Tsunami Fender from Lowbrow Customs bolts right in place of your stock rear fender (cutting rear fender struts required) and instantly changes the look of your bike. The Tsunami Fender is the go-to choice for tracker style bikes whether for the street or hooligan races on the dirt track. The heavy aluminum construction gives you many options between paint or polish, ready to rock right out of the box. I'm trying to paste a picture but for some reason it's not allowing me. All good theo my bike is looking pretty great. Thanks y'all . THESE ARE AWESOME! EASY TO INSTALL, FIT AND LOOK GREAT. HAVE THEM ON TWO BIKES NOW... WOULD DEFINATELY RECOMMEND.